Superintendent Mark Sugden and Mayor Steve Russell on the site with members of Berowra RFS. Hornsby Shire Council has announced that it is going to build a new Rural Fire Station in Berowra, with the plans approved at this week’s meeting. “This represents a further strengthening of the powerful relationship between Council and the RFS,” said Hornsby Shire Mayor Steve Russell. The station will be next to Berowra Oval, where it will have fast access to both Berowra and the freeway, and it will be able to accommodate three trucks. 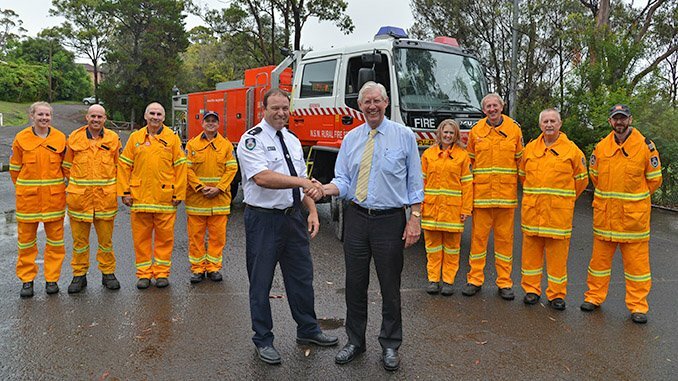 RFS Hornsby/Ku-ring-gai Superintendent Mark Sugden is thrilled by the decision. “We’re very grateful to Council for their assistance and we look forward to continuing our partnership with them,” Superintendent Sugden said. “The current station is no longer suitable, as it is located in a residential area and cannot accommodate modern firefighting trucks. The plan has received strong support from the community, including 14 submissions and a petition. When Council unanimously voted in favour of the proposal it received loud applause from the audience, which is rare at meetings. The project is not just a boon for the RFS, it will also bring new sealed car parking for the Berowra Oval club building and improve local drainage so heavy rain does not affect the sportsground as much. “We look forward to working with the RFS to bring this to fruition,” Mayor Russell said. A timeline has not yet been decided, but construction is expected to begin early in 2017. The project is valued at $1.3 million.